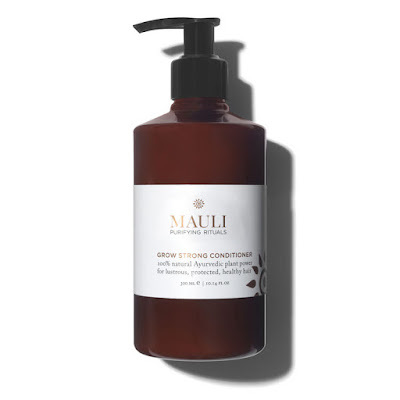 Improve the strength and condition of your hair by following this three step hair rescue ritual – using the shampoo, conditioner and hair oil by Mauli. Harnessing the remarkable plant power of India's most nutrient dense botanicals, the natural Ayurvedic strengthening shampoo has been expertly formulated in England to bring lack-lustre hair back to its former glory. 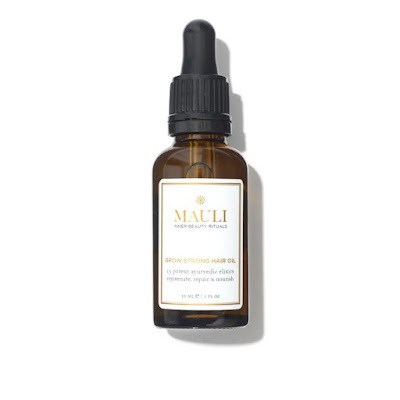 The vitamin rich, deeply cleansing weightless formula of amla, ashwaghanda, aloe vera, brahmi, turmeric, shikakai, and argan, infused with nourishing holy basil, Himalayan cedarwood, cardamom, patchouli, vetiver, frankincense and fennel combine to give dehydrated scalp and hair restored thickness, strength and shine. This intensely creamy, vitamin rich formula of amla, ashwaghanda, bhrami, turmeric, shikaki, & argan enriched with restorative holy basil, cardamom, patchouli and vetiver combine to leave brittle hair beautifully repaired, hydrated and silky soft. Restore life and vitality to your locks with Mauli Grow Strong Shampoo, a deeply nourishing treatment inspired by the plant power of Indian botanicals. Enriched with a potent blend of ingredients including Turmeric, Frankincense, Argan and Himalayan Cedarwood, the cleanser expertly lifts away excess oil and impurities whilst replenishing vital moisture. Helping to rebuild damaged strands and smooth the hair cuticle, the shampoo leaves locks looking thicker, stronger and infused with brilliant shine.